It sounds random, but Global Equities Research analyst Trip Chowdhry is claiming that Steve Ballmer, Microsoft's CEO, will be joining Apple during their WWDC keynote. It's not completely crazy though—Bill Gates jumped onstage back in 1997 at Macworld. 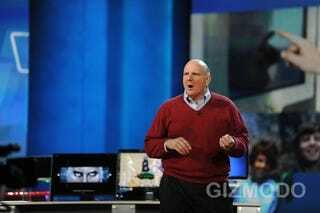 So what will Ballmer be evangelizing about during Apple's big iPhone 4 reveal? Err, Visual Studio 2010, according to Chowdhry, which lets developers create iPhone, iPad and OS X apps on Windows. Apparently seven minutes have been "blocked off" for Ballmer, presumably with time being given to developers, gaming publishers and the like.